The calendar may say spring but the only sight of spring that I see is the growing brown spots on the hills surrounding Mammoth. I guess we are moving in that direction but the clouds still spill snowflakes down upon us and the wind still blows. The sun is still lacking but I have noticed that the days are reaching into those more comfortable 40's temps. I have been waking up to snow on the ground and my windshield lately but the ever growing supply of mud in the Yak does let me know that spring is slowly but surely creeping into the Mammoth area. With the my job and location transition right around the corner I find myself doing that unenviable task of boxing up my possessions (this is my 6th time in 2 years). Since Patrick had things that needing to be moved back to the Lake apartment we loaded up my vehicle and headed towards Lake after a careful review of the weather report. The skies were fairly sunny in Mammoth but after heading up Golden Gate, around Bunsen Peak and finally making the crest onto Swan Lake Flats we found, as can be expected, different weather conditions completely. More snow and wind. Nothing too horrible that made us want to turn back. As had been our experience the previous Saturday we only saw one bison as we made our way to Canyon. At Canyon we found that a pathway had been plowed to the door of the Adventure Store. In the back of the store we found that a plow had been there, too. But still the snow towered above our heads. We also found men working hard to clear the snow from the roof of Canyon General. They used long saws to cut the snow into huge blocks. And then slid the blocks down and off the roof. On our trip through Hayden Valley as we headed south we saw only a handful of Canada Geese and a few ducks swimming in the Yellowstone River. It wasn't until we got past Mud Volcano that we saw our first wildlife. A coyote found itself a bison carcass to scavenge. As we sat and watched this nervous little fella a bald eagle swooped in and grabbed a claw full of wet dead grass. The eagle flew off with its prize. On our way back from Lake we found a totally different animal scavenging the carcass. While the very full coyote napped in the sun a few hundred feet away this sly little fox came in to fill its stomach also. During the winter months at Lake the residents use this garbage truck to dispose of their household trash. This pine marten has decided to make the garbage truck its home. We enjoyed watching the antics of the pine marten as it crawled over the cab of the truck, behind the cab and even onto the wheel and stick its head out of the wheel well. The notoriously crafty animals have been known to find their way into the apartments through drier vents and holes as small as 3 inches. Last fall a resident came home to find a pine marten running around their apartment and and their pet canary dead. Coming back through Hayden we found this coyote curled up at the top of a hill watching another coyote running around the valley floor (that tiny little dot is the other coyote). The other coyote eventually started to make its way up out of the valley (yet again, that tiny little dot is the coyote). The bison, elk and antelope have been making a showing at the north entrance. Bison have been wandering around the store in Mammoth reminding us that even a task as easy as taking out the garbage can be wrought with challenges. With just over a week to go for me I am beginning to have that pit in my stomach that lets me know that it is never easy to leave good friends behind, even if it is only temporary. With promises that we will see each other over the summer months we gear up for our goodbye. I will be seeing Judy and Andrea at Manager Meetings in West Yellowstone but it's always sad to think I won't see them on a daily basis. Only one more Taco Tuesday to go and we will be hanging up our sunny yellow hats and aprons. New friends are right around the corner, as is a new and exciting 2011 summer season at the Adventure Store. Is There A Disney Ending in Yellowstone? Some families come to Yellowstone to view the geysers, the canyon, the mountains and some come to view the amazing wildlife here. They leave with lots of memories and photo albums filled with family pictures and videos of some great wildlife action. They will either remember their Yellowstone vacation as something like a scene out of Family Vacation or a PBS special. However, lately I have been reminded that for the wildlife here in Yellowstone there is rarely a Disney ending. The plows had made it to the government area by Lake this week, and with some items at the apartment that Patrick needed, we needed to make a trip to Lake. This was our first trip by car to Lake since last November. Items that were needed after the roads closed and that could not be strapped to the back of a snowmobile had to wait until this time to be retrieved. There was a lack of animals to be viewed on our trip down, we only saw one bison before we got to Canyon. Sometimes the walls of snow next to the road were so high that viewing anything but the channel of road in front us was all that we could see. Just south of Canyon we came across this bison. He was thin and moved very slowly. With the snow so high on each side of the road he would have to travel some distance to get off the road, he appeared much too weak to tackle getting up and over the snow. But that didn't matter much since if he did get over the snow there wasn't much on the other side but more snow and nothing to eat. When we passed by again 4 1/2 hours later we found him exactly where we left him, standing in the road as if wondering to himself what his next move was. There will be no soft-fuzzy Disney ending for this beast. Chances are he will be a carcass within the next week or so. It's hard to imagine that I will be walking through the doors of the Adventure Store in just over two weeks. The snow is so high that it comes to nearly the bottom of the signs. The Canyon Yellowstone General Store is underneath this snow! They are still working to remove the 5 - 6 feet of snow that is on the roof. Some of the roads in Canyon Village have been plowed. The walls of snow are almost as high as I am. Grizzly Drift is nearly 12 feet high. There is a wall of snow on the other side of the road so it is much like driving through a snow hallway. There was not much wildlife in Hayden Valley, just miles and miles of pristine snow. We only saw one coyote munching on his lunch while a raven sat 20 feet away waiting his turn to scavenge what was left. There were a few water fowl and swans on the Yellowstone River and just the occasional bison, I counted 6. Most were some distance from the road and were only silhouettes off in the distance. We were able to watch this bison show how difficult it actually is to wade their massive bodies through deep snow. His struggle was long and tedious. He would occasionally stumble in the snow and his huge body would crumple into the snow. Sometimes he would lay there for awhile, and sometimes he would thrash around trying to regain his footing. With snow squalls and the wind obliterating my view of him it was like watching a wildlife movie showing the struggles of wildlife against nature. I couldn't help but think about the energy that was being spent on trying to move to a new location that just might have enough food. The ending for two bison by Le Hardy Rapids was as dramatic on Friday. They fell through the ice into the Yellowstone River. The road north of Fishing Bridge Jct. We found these two bison walking the road as we headed toward Madison. These two were in good shape and will probably live to see the sun and grasses of summer. The plows made it to just south of Madison Junction. Snow removal equipment parked until plowing is continued on Monday. Though there are bison and elk dying because of this snowy winter there will be a good ending for some of the species here in the Park. The male bears will soon be emerging from their dens and they will find a bonanza of food in the form of carcasses. The wolves, coyotes, foxes, etc. are finding plenty to eat and they will not go hungry. This winter has brought me face-to-face with the cold hard facts of how life can be here: for every death there is a birth, for every empty stomach there is a gluttonous feast, for every sad ending there is a happy one and for there to be a winner there needs to be a loser. At this point I am being reminded of the flip side to the happy Yellowstone summers. And though I watched with a lump in my throat yesterday I know that very soon I will feel the excitement of watching babies taking their first wobbly steps, the bison grazing the green grasses of Hayden and seeing the visitors taking pictures of videoing their great Yellowstone experience. And that is what I will focus on, my Disney ending. The Mammoth Yellowstone General Store gals and I made our annual trek to Chico Hot Springs for our dinner on Monday evening. Using our winter tip money we splurge on a wonderful dinner that includes appetizers of baked brie, shrimp cocktails and escargot. Entrees included prime rib, shrimp scampi and delectable steaks garnished with Gorgonzola. It was an evening of high dining that was completed with 3 Berry Fruit Crisp, Moose Track Pie and Amaretto Cheese Cake. And since we are such high class and fashionable ladies (way to use those bread sticks as drum sticks, Judy!) it was a dinner that fit our style. Andrea scarfing down her Baked Brie and remain scurvy free (that is our code word for consuming margaritas). And nothing says 'classy!' as an aluminum foil swan to bring home leftover prime rib. Doggy bags will never do for me now! As we let dinner digest two days later winter still swirls around us. We are in a winter weather advisory until midnight tonight and most of the day we could look out our store windows and watch the wind whip up the falling snow. There is really no measurable amounts in Mammoth but snotels (pronounced: snow tells, not: snot ells like Andrea and I originally thought) in various mountain areas were reporting up to 10 inches by this morning. Spring is Sunday but winter can still rear its snowy head. Earlier this week there was a carcass on the hill behind the YCC building. Coyotes and wolves could be heard yipping and howling during the night hours. It didn't take long before there was nothing visible but a dark patch of snow where the elk had been. I also saw a fox running across the road in front of my car in the Yak last Tuesday morning. Just a one mile drive in Mammoth can be a wildlife jackpot. Andrea and I spotted antelope near Gardiner last Friday afternoon. Neither one of us had seen an antelope in many months so it was nice to see them. Last week bear prints had been found in Hayden Valley and I'm sure there have been a few other bears coming out of their winter slumber. I am looking forward to my first 2011 bear sighting. 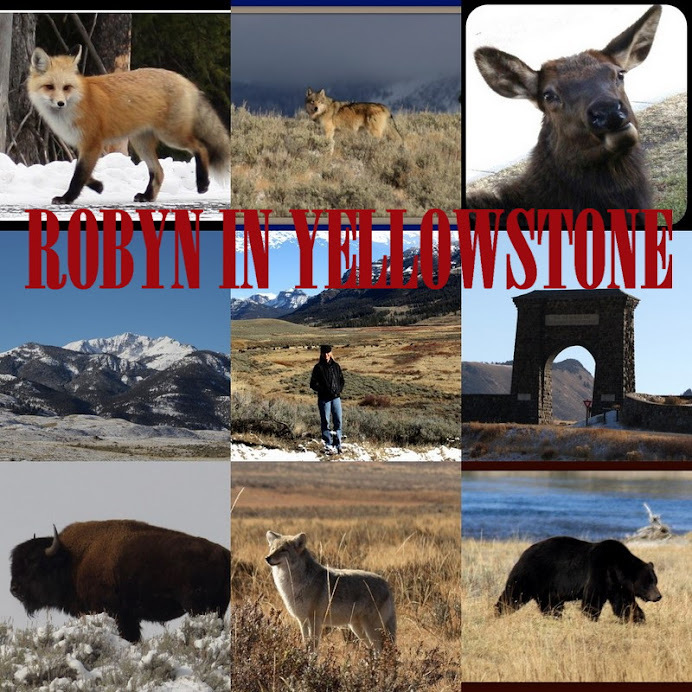 2011 is going to be another great Yellowstone year. The plows rumbled out Monday morning between 7:30 and 8:00 am. So far they have made it to Norris. A steady stream of snow coaches have been hauled by flatbeds past the store to be stored near Gardiner until next December. The hotel and dining room are closed and most of the Xanterra employees will be leaving today. It is the end of the winter season. Yesterday was our largest Taco Tuesday this winter with lines winding through the store. We eventually ran out of taco meat and a few had to rely on our regular lunch menu. We love those busy days when we get to see the faces of so many that we have gotten to know. Our last lunch for the winter season will be served in 3 weeks on March 29. A week later I will leave Mammoth and head down to the Adventure Store in Canyon. Time is going fast. We have been experiencing the occasional snow flurries and winds these past few days. But the sun has been making an appearance. Andrea and I actually sat outside to soak in the suns rays (and some vitamin D) during our lunch break Monday. We sat there squinting from the brightness as if we had just emerged from a cave. The sun improves everyone's moral. There are moments when you just have to pause and take in everything around you. Clouds were billowing and snow was falling in the distance. When the sun peaked out from a cloud bank over Lamar Valley all I could think was "Wow". Between the snow and the shadows I could have easily become totally entranced this powerful sight. There truly is no other place like Yellowstone and I never have to remind myself how incredibly lucky I am to be here and experience the sights and sounds that are offered to me everyday. The spring plowing is to get underway tomorrow morning, March 7. In the maintenance area the plows are lined up and ready to start this task. Patrick and I had planned on snowmobiling to Lake yesterday but with the arrival of new snow it was decided that we wouldn't go. This is the last weekend that we would be able to check on his apartment, now it will be about 3 weeks before we will be able to get there. My next trip to Canyon will be via a car. Though I may be facing a couple more months of snow we know spring is right around the corner once those plows start moving south from Mammoth. The Mammoth Hot Springs Hotel will be closing tomorrow, this being the last night of guests staying the night. It will once again be quiet in Mammoth with only a few visitors roaming the roads of YNP. The winter season is coming to a close. Though the day started of with flurries they eventually stopped. We decided to take an afternoon trip to Lamar. There were the usual bison on the Blacktail. This bison had leaped across snowbank and found itself on a ledge above the road. It paced back and forth deciding its next move and for awhile I thought I might see him tumble back down onto the road. He eventually found his way up the hillside but had to use great effort to reach the top. Further on we came across this bull elk slowly wandering down the road. He was unconcerned about any passing vehicles. He moved very deliberately and at a snails pace. The winter had taken a toll on him and it was apparent he was very weak. I took one quick photo as we passed him. His eyes seem to tell the story of how difficult the winter has been on him. As we left him in our rear view mirror we were quite certain that he may not survive to see the spring. We did see him on our return about 1 1/2 hours later. He had only walked 1/4 of a mile. Most of the wildlife I have seen these past few weeks I saw grazing on the south facing slopes or in the tree lines where the snow is not as deep. Open areas have very few, if any, tracks of animals that had passed through the area to graze. Some of the hillsides have little snow from the wind blowing it away. There are many animals competing for these open areas. Though I have come accustomed to seeing thin animals there are still many that are in good condition and making it through this winter just fine. I have been seeing a small herd of bison by the hitching posts in Lamar. This fella was right off from the road grazing on some vegetation that stuck above the snow. But this picture shows how deep the snow is. It must be terribly difficult to try and move through the snow and swing their massive heads to clear it away. And of course the four bighorns were still in their usual location across from the hitching posts. I enjoy seeing them.